KidsCrossing is the children's ministry of The Crossing, serving kids ages 5th grade and under. Blending fun activities, technology, small group time, and large group worship, we create experiences for kids to learn who God is and find out just how much He loves them. Spiritual development is a life-long journey. We believe children can begin to explore who God is, how much He loves us, and how we can respond. Both the church and families play a key role in the spiritual development of kids. We aim to provide safe and engaging environments that provide opportunities for kids to investigate truth claims, ask tough questions, and build relationships with friends and trusted leaders. Our prayer is that each child will choose to accept the free gift of grace and cultivate a personal relationship with Jesus. We offer multiple rooms, segmented by age, to ensure play time and lessons are age-appropriate. All of our staff and KidsCrossing team members are background checked and well trained to ensure your mini-me has a safe and fun experience. On your first visit head straight to the KidsCrossing registration desk—ask anyone in a lanyard and they'll direct you right to us. Our friendly weekend hosts will meet your family and get your kiddos registered for our kiosk check-in system. They'll then help you get your kids to their rooms and connected with some team members and friends. This process takes some time. We recommend getting here about 20 minutes before service. If you’d like to speed up your first-time check in, fill out our New Family Registration Form now. We're glad you asked! Safety is a top priority for The Crossing, especially in KidsCrossing because we know you wouldn't leave your kids with just anyone. But it's not just physical safety, it's emotional safety too. KidsCrossing is a place kids can share their doubts and ask difficult questions. We use a claim tag system to ensure your child’s safety. In order to pick up your child, you will need to show the claim tag given to you at check-in. Our KidsCrossing hosts will verify that the number on your child’s name tag matches your claim tag and will collect both of them as you leave. KidsCrossing room doors are locked shortly after the service begins and unlocked as services end. Limited staff and team members have the ability to open those doors. There are a whole bunch of other safety measures we have in place to keep your kiddo as safe as possible during their time at KidsCrossing. If you have further questions, please ask! If you are attending in Chesterfield you will receive a text message informing you to come to the KidsCrossing lobby. If you are attending at our Fenton or Mid Rivers campuses the 3-digit number on the parent claim tag that you were given at check-in will appear on the bottom left of the large screens in the auditorium. If you see your number, that’s your cue to discretely slip out of your seat and go back to your child’s room. But be sure to bring your claim tag with you to enter the room. How early prior to service can I print my child’s tags? Name tags can be printed 45 minutes prior to service time. 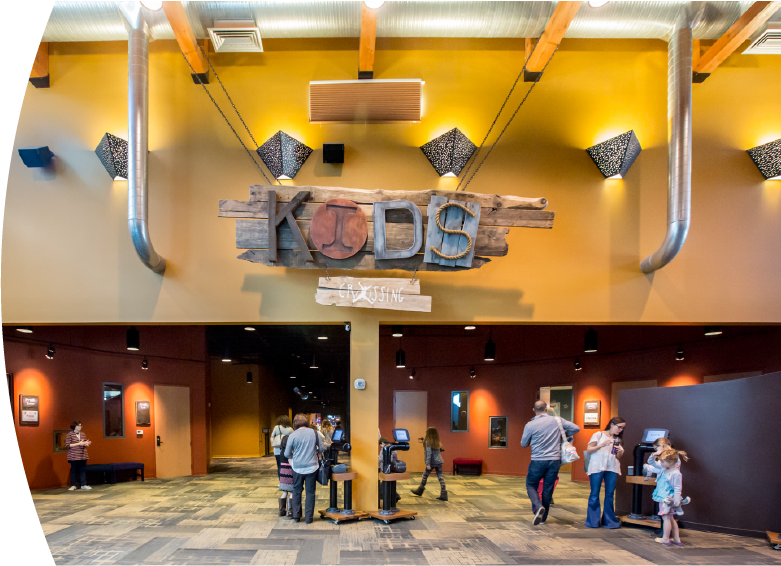 KidsCrossing doors open to greet and check in children 20 minutes before each service. Prior to that, our KidsCrossing teams meet and pray so they can be fully prepared to welcome your kids. Can my child with special needs attend KidsCrossing? We do our absolute best to accomodate kiddos with special needs. For us, it comes down to having the right team members who can give your child the attention that they need. Please call us during the week at 636-532-1212 or email info@thecrossing.church for more information on how we can serve you. Why are there instances when a room is closed? We want every child that walks through our doors on the weekend to be able to experience KidsCrossing. We also want our volunteer team members to enjoy their experience and realize there is a limit to the number of kids they can safely manage. We have specific child-to-adult ratios set for each room that we believe are crucial for making sure the room can be safely managed and that team members will be able to successfully interact with the kids and make KidsCrossing meaningful and engaging for them. We also have maximum room limits set per fire code. We do our very best to have enough team members to ensure that all kids can participate in KidsCrossing at each service, but there are times when we simply have to close a room for the benefit of everyone in the room. In those instances we encourage families, especially with little ones, to watch the service in the family section at each campus. Can my child be baptized at The Crossing? Because baptism is such an important decision, and a highly symbolic expression of a child’s choice to make Jesus the leader of their life, we want to be sure that kids know exactly what they are doing. There is nothing in scripture that states at what age someone can be baptized, but at The Crossing we do practice a believers baptism and that, coupled with what we know about child cognitive development, has led us to prayerfully and humbly designate that children must have finished 3rd grade or above in order to participate in our baptism process. For more information visit our baptism page. For parents of kiddos under the age of three, we offer the opportunity to participate in our child dedication service, to publicly declare your commitment to raise your child with Biblical values. This is not a practice found in Scripture and, by no means do we mandate it for parents at The Crossing. However, our child dedication service really is a great way to celebrate what you’re doing as a parent and what we want to do with you as a church. 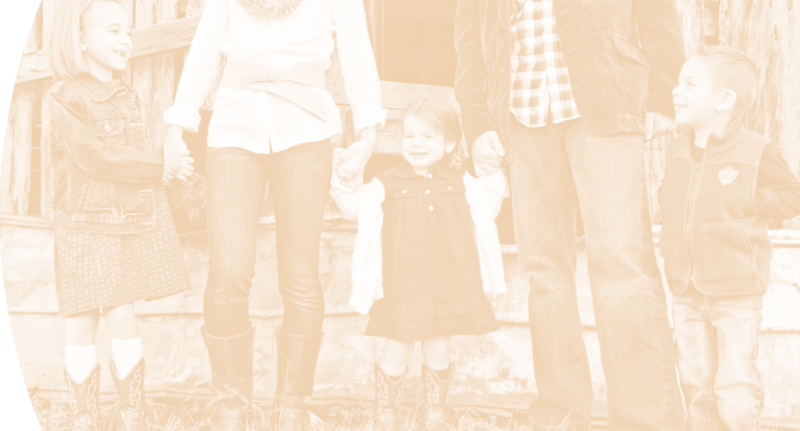 Typically, our child dedication services are scheduled once a year in the fall. Watch for sign-ups on our calendar. Are there activities outside of the weekends offered for kids? We do not offer any regularly scheduled activities. Rather, we try to be extremely intentional and pour much thought into any decisions we make including what types of events to hold. We will continue to explore ideas for possible outside-the-weekend activities for our kiddos of all ages, but will do so with purpose and intentionality that correlates to our mission. We do not hold vacation bible school (VBS) for a few reasons. The main reason is that we put all of our efforts and energy into providing the most meaningful, engaging, and fun experience possible every weekend for our kids. Second, relationships are a huge part of KidsCrossing and a week-long VBS is not conducive to forming lasting relationships between students or between students and small group leaders. Lastly, we are a volunteer-driven ministry. The majority of our team members serve throughout the ministry year and we offer them the chance to take some time off in the summer.